In March of 1979, George Gleason II became the owner/operator of a small Arkansas community bank in Ozark, Arkansas. Gleason’s background and how he purchased the bank was anything but ordinary. The 25 year old former attorney had zero banking experience and only $10,000, but was able to convince a Little Rock Arkansas bank to help finance the $3.6 million purchase of Bank of the Ozarks (OZRK). It didn’t matter that Gleason had zero banking experience. He, like other intelligent fanatics, possessed all the right qualities to achieve unusual results and those who knew him could guess he’d be successful. Since George Gleason’s arrival in 1979, Bank of the Ozarks has grown total assets from $28 million to roughly $18 billion today. Each year the bank has been profitable and not surprisingly, the bank was prepared during the financial crisis. Fifteen acquisitions have occurred since 2010 making Bank of the Ozarks the largest bank in Arkansas. Investors who partnered with George Gleason in the bank’s 1997 IPO, have achieved a 22% compounded annual return, including dividends. To contrast, the S&P 400 mid cap index has only returned 10% annually and many competing banks have earned less than 4%. Just like our other intelligent fanatic case studies on Middleby Corporation (MIDD), Patrick Industries (PATK), MTY Food Group (MTY.TO), and DaVita Corporation (DVA), Bank of the Ozarks too was a microcap company before its ascension. A reoccurring theme amongst intelligent fanatics is that they lack direct experience in the industry they eventually dominate. This provides them with a fresh perspective necessary to see things differently. George Gleason fit the mold well. He acquired significant business experience from his parents, both owners of small businesses in the small town Dardanelle, Arkansas. They owned cattle, poultry, row crops, rental property, a retail store and a feed mill. From the age of five Gleason began taking over simple responsibilities at the different businesses. As he grew older, those responsibilities grew. He was running books at age twelve and filing tax returns at age fourteen. Having various business experiences from a young age doesn’t automatically guarantee an entrepreneur can grow a microcap into a large successful company. George Gleason also possesses a superior intellect, work ethic and focus on being the best that was apparent early on. He was valedictorian of his high school class, graduated with a degree in economics from Hendrix College in two years achieved the highest score for his bar in Arkansas. Richard Atkinson, one of Gleason’s law professors at UA Fayetteville, recalled in 2005 that Gleason was special when he was a student. Employees and businessmen could see George’s abilities early on, too. Bob East partnered with Gleason on development and construction deals in the 80s and served on the bank’s board of trustees for numerous years. Gleason acquired a few branches early on, but for the first fifteen years the bank’s growth was slow. He focused first on dominating a small market, building his knowledge of banking, and building a foundation of the bank’s culture. An opportunity arose in 1994 when banks in Arkansas were able to expand into other counties. Gleason smartly expanded not through automated tellers but through a “de novo” strategy, opening new branches. He believed offering services comparable to a larger regional bank, but with a small town feel on building customer relationships was the right strategy for the time. This allowed him to continue to build the culture from the ground up since he thought, “If two banks of size merge, there are two different cultures, two different ways of doing business, two different philosophies that have to come together. But by building one branch at a time, we may typically have 20 or 30 new employees with whom you can sit down and talk about your bank and your way of doing business.” Gleason was creating a culture that mimics his own drive to succeed and he needed a strong cultural foundation for his employees to work off of. A key focus at the bank from the beginning has been to identify, hire, direct and motivate highly capable managers to constantly stretch themselves and meet the company’s goal of not being the biggest, but the best financial institution. Gleason created an environment that encouraged employees to reach higher and act like owners. An ownership mindset was developed through a decentralized management structure of 11 separate profit centers allowing managers to make credit and other banking decisions efficiently. Profit center managers and their staff have been encouraged to pursue what they believe is the best course for their business. This was an outgrowth of how Gleason treated employees when he first joined the bank. When he took over the bank he acknowledged employees knew more about banking them him. He said, “So I would listen to them pose the question and I would then say, ‘Well, I want you to tell me what you think we ought to do, and why you think that’s the right solution.’ ” This built up trust amongst the early employees and their young inexperienced owner/operator and set the course for future success. Contrast Bank of the Ozarks’s quick acting, decentralized management style with the byzantine, slow bureaucracies found at most banks, big or small. The bank’s success also could be attributed to each employee’s tangible incentive. They were paid directly on performance of their profit centers, each with slightly different metrics to achieve. Aside from business lessons, George Gleason’s parents instilled in him an above-average appreciation for and aversion to risk. In the housing bubble while other banks were over stretching their risk with subprime and questionable commercial real estate loans, Bank of the Ozarks was scaling back risk and sitting on the sidelines. Opportunity arose after other bank’s high-risk actions came to an end with the financial crisis. 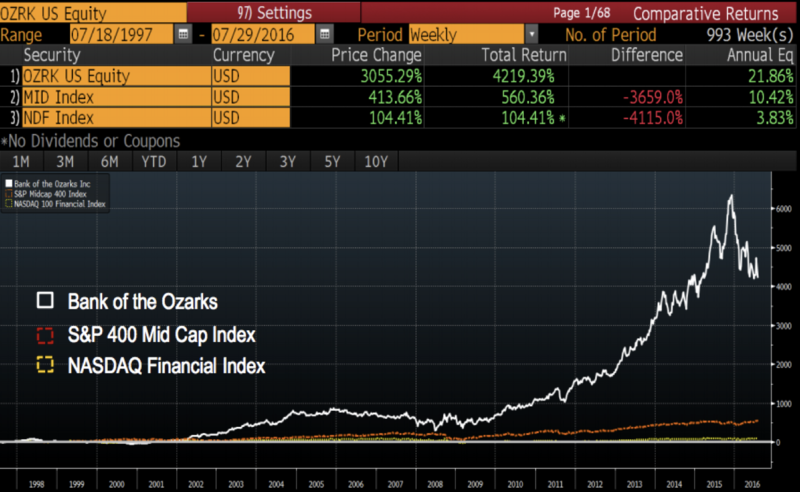 The results of the disciplined capital allocation have compounded Bank of the Ozarks’s capital at a high rate over the past decade. 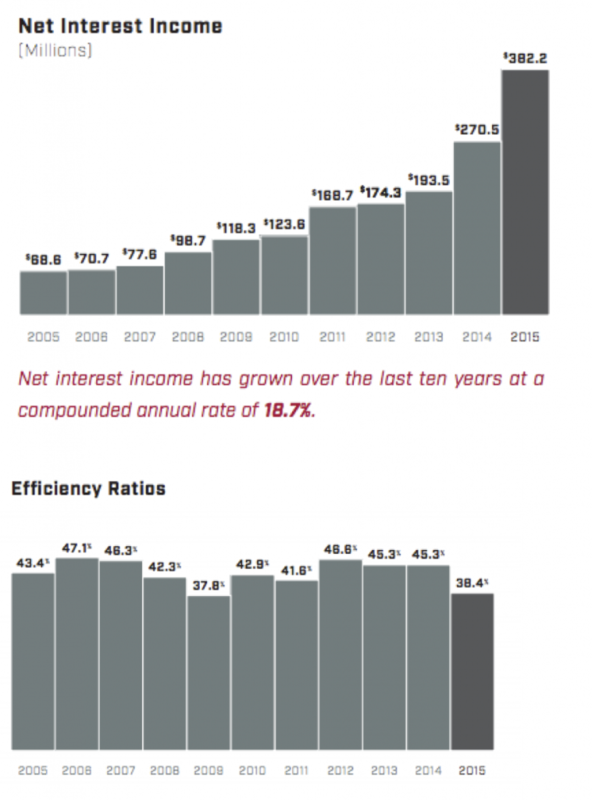 Net income grew 18.7% annually and has maintained returns on equity and efficiency ratios at the top of the banking industry. Clearly George Gleason’s culture of excellence has been performing extremely well and is likely to maintain the performance into the future. A lot of our competitors tend to move as a pack and are heavily driven by headline risk and headline perceptions of market conditions. We have always tried to have a much more nuanced and intelligent and deeply analytic approach to originating credits. You can read the headlines and run with the herd, but when you do you miss tremendous opportunities and you often are running in the wrong direction. So what we have tried to do is sort of ignore the headlines to a great extent, I mean certainly you to have to take larger macroeconomic and market themes into account. But we have really tried to not let that drive our decisions, but instead to look at the supply demand metrics of each sub-market market and macro market and the relative competitive position of each product in the market and do a much deeper level of analysis on projects. So as a result of that, we are finding tremendous opportunities in Manhattan, Miami, Houston, Dallas as well as markets that probably have gotten better headlines, such as California and Seattle and Denver. So we are really doing our homework as we always have done and really developing detailed supply-demand analytics and models on the market and finding great business in a lot of markets where you are seeing some fairly negative headlines. George Gleason in retrospect clearly is an intelligent fanatic, however, early on he shared many of the same characteristics as other intelligent fanatics we have studied. We do not think this is a coincidence. As you might have noticed with our write-ups on intelligent fanatics, such as Selim Bassoul at Middleby Corp or Kent Thiry at DaVita, there is a fairly consistent pattern. Extremely adept business leaders run these companies. Their corporate cultures and strategies might not be exactly the same but are quite similar. It takes a significant amount of qualitative due diligence to find these leaders early. If you’d like to continue to build your mental model on intelligent fanatics, read the Intelligent Fanatics Project, which provides more in-depth case studies and further ties in the common characteristics and strategies of these rare leaders. Johnson, Scott A., “George Granville Gleason II” Arkansas Democrat-Gazette, 2005. MicroCapClub is an exclusive forum for experienced microcap investors focused on microcap companies (sub $300m market cap) trading on United States, Canadian, and UK markets. MicroCapClub was created to be a platform for experienced microcap investors to share and discuss stock ideas. Investors can join our community by applying to become a member or subscribing to gain instant view only access. MicroCapClub’s mission is to foster the highest quality microcap investor Community, produce Educational content for investors, and promote better Leadership in the microcap arena. If you enjoy the search for the next great company, Join Us. Thank you Sean for the article. One question – for table #1 and #2, wouldn’t “book value” have been more meaningful instead of “total assets”, is it just me? Art, book value would have been more insightful to get a better idea of capital allocation. However, it was difficult to figure book value on some of the acquisitions, especially the fed assisted transactions as some were private. We can just assume that OZRK paid a very low multiple to book value and had very little downside. OK I see. Thanks for clarifying Sean. Wanted to comment on OZK. Great article! and apparently a great opportunity right now! It has sold off significantly and its trading at 85%-90% of BV. The track record is amazing! It seems to have had a “bad” quarter because of some bad loans, but its something definitely temporary and honestly not that bad, its just banking. Just wanted to hear your thought about it. Brian, thanks for the comment and the companies. Thanks for this excellent write-up on G. Gleason. I have been following the exceptional accomplishments of OZRK for many years. Among many other factors, I have been particularly struck by the bank’s multi-year efficiency rating, and its astonishingly-low loan-to-cost (LTC) value on commercial projects. The housing crisis would have been impossible had all bank underwriting followed that of OZRK’s conservative position. The more that I learn about his 38 year OZRK career, the more that I believe Mr. Gleason is to banking what Warren Buffett is to investing. This is a great article. Thanks for putting it together. I am curious, what is the source of Richard Atkinson and Bob East’s comments? I can’t find them anywhere online.